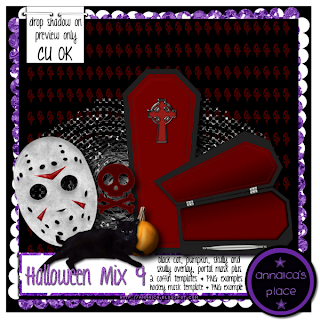 ♥ I Love Lucy DigiArt Designs ♥: CU Halloween Mix 4 Now Available! CU Halloween Mix 4 Now Available! Here is the last Halloween commercial use pack I am adding to stores this year... I think LOL! This designer resource pack has 2 coffin PSD templates- one standing and one open with the PNG examples as shown in preview, 1 hockey mask PSD template and the PNG shown in preview, as well as one black cat, one pumpkin, one portal mask, one skully and a skully overlay. All sized to be used for either full-size scrapbooking or tagger size. 300 DPI. You can purchase HERE or HERE or HERE!